GDP rose in the third quarter of 2016 after being pushed down for the first half of the year. IRELAND’S GROSS DOMESTIC product (GDP) is starting to expand again, after being depressed for the first half of the year by 2015′s ‘leprechaun’ figures. According to figures from the Central Statistics Office, Ireland’s GDP, which measures all the goods and services produced by the country, expanded by 4% in the third quarter of the year. This is the first quarter in 2016 when the GDP figures increased. GDP in the first two quarters of the year was down compared to the first half of 2015. The CSO announced earlier this year that Ireland’s GDP rose by 26.3% in real terms last year, a figure that was up massively on the organisation’s previous forecast of 7.8% and put Ireland’s growth figures head and shoulders above every other eurozone country. 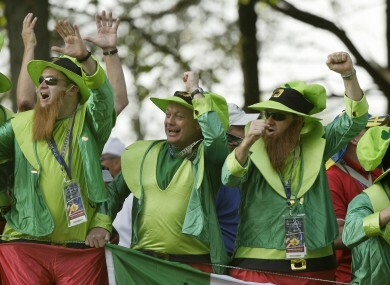 The figure quickly drew scorn from many notable commentators, including Nobel laureate economist Paul Krugman, who said that the official stats were an example of ‘leprechaun economics’. The data from 2015 was skewed by a number of factors, many of which were likely due to the large presence of multinational companies in Ireland. Davy chief economist Conall Mac Coille said that Irish GDP data “had a weak start to 2016, down 2.1% in Q1 and 0.6% in Q2″. “Measurement problems and the volatility created by Ireland’s artificially inflated 26.3% GDP growth in 2015 depressed the figures for H1 (the first half of) 2016,” he said. Davy had originally projected 6% growth for the third quarter of the year. However, it said that the Irish economy is still performing strongly. “Other indicators point to an exceptional year of economic expansion. Jobs growth will be close to 2.8% in 2016, the strongest pace since 2007,” Mac Coille said. Consumer spending rose by 0.7%, although growth in this area has slowed down since 2015 when it grew by more than 1.5% in the first quarter of the year. Core domestic demand, a key economic indicator, dropped by 1.8% during the third quarter compared to the second quarter of 2016. However, Gross National Product (GNP), the amount of income produced and retained by citizens of a country, rose by 3.2%. The CSO has also set up an expert group that is looking for new ways of measuring domestic growth and information. Email “Six months on from 'leprechaun economics', Ireland's GDP is finally bouncing back”. Feedback on “Six months on from 'leprechaun economics', Ireland's GDP is finally bouncing back”.